Geothermal energy uses the heat energy of the Earth to produce heat or electrical power. Geothermal works as an alternative energy source because the inside of the Earth is much hotter than the surface. Geothermal energy is a renewable energy source which is clean as it does not pollute, and is also very well suited for home heating and cooling. One of the major disadvantages of using heat pumps for the heating or cooling of buildings is that they exchange heat with the atmospheric air around them. This atmospheric temperature varies with changes in the seasons reaching hot and cold extremes during a year. So if another heat source with an almost constant temperature was available, were heat could be absorbed during the colder seasons and dissipated during the hotter seasons, the refrigeration cycle used for the heating and cooling of our buildings would be more efficient throughout the year as it would not be affected by seasonal temperature extremes. A geothermal heat pump (GHP) or ground source heat pump (GSHP) is a central heating and/or cooling system which works like a refrigerator but in reverse by extracting thermal energy from one area and dissipating it in another area. Geothermal heat pumps utilizes a heating and refrigeration cycle with the ground being used as the medium to dissipate heat from its condenser during the summer (heat sink) as well as to absorb heat by using its evaporator during the winter months (heat source). As the geothermal heat pump and the ground source heat pump systems use the ground or geothermal water course as its heat source they operate more efficiently, because it is not affected by large temperature variations of the air above it. In contrast, an air source heat pump draws heat from the colder outside air and thus requires more energy. Believe it or not, you do not have to dig very deep, only about 2.5 metres (8 feet) or so down just below the frost line to find the level of earth that stays at a fairly constant temperature all year round. Of course this constant ground temperature depends on the latitude of the region where you live, but can range from approximately 6oC (42oF) in the colder northern countries and close to 20oC (69oF) in hotter equatorial countries. Ground source geothermal is generally too low a temperature for electricity generation but can be utilized for space heating, cooling and other such uses. Which means you might be able to install a ground-based geothermal heat pump to either heat and cool your home making it a cost-effective alternative to conventional oil or gas fired home heating. 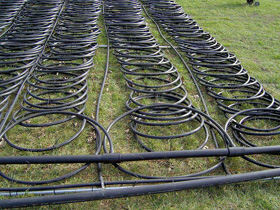 A Geothermal heat pump uses long plastic (polypropylene) spiral piping system as shown in the image, of diameter between 20mm to 75mm (3/4″ to 3″) and over 80 metres (approx. 250′) long buried horizontally in the ground. A water pump circulates a thermal carrier liquid, usually water with a mixture of brine salt or antifreeze, through these closed loop pipes which carries the cooling or heating fluid, known commonly as the “refrigerant”. This heat absorbing fluid goes through a cycle of condensing (taking heat) and evaporating (giving heat) that moves heat between the pipes and a heat exchanger. As the fluid circulates through the pipes underground, it absorbs heat from the ground and, on its return, the now warmer fluid passes through the heat pumps heat exchanger to extract the heat from the fluid which is then used to heat the building. The re-chilled fluid is sent back through the ground thus continuing the cycle. Unlike refrigerators and air conditioners, ground source heat pumps can work in both directions, heating and cooling, so by switching the direction of heat flow, the same system can be used to circulate the cooled water through the house for cooling in the summer months. The heat is exhausted to the same relatively cool ground rather than delivering it to the hotter air outside as a conventional air conditioner does. As a result, the absorbed heat is pumped across a smaller temperature difference which leads to higher efficiency and lower energy usage. Ground-source heat pumps are not completely green because they consume electricity for heating or cooling the home but the energy cost savings with a ground-based heat pump are substantial using up to 60 percent less electricity than traditional heat pumps because they do not have to create their own heat, just move it from place to place. Modern technology has helped to make geothermal heating an economically viable option for use in any geographical location. There are several major design options available for geothermal energy systems which are classified by their thermal fluid and ground heat exchanger layout, with the horizontal spiral coil being the most common due to their simplicity and ease of installation. That is no deep holes to dig. Geothermal heat pumps for ground source heating do have higher capital costs but is offset by their lower operational costs compared to other forms of domestic heating and cooling (HVAC) systems. Generally speaking, the lifespan of a geothermal heat pump installation is much longer than for a conventional heating and cooling system, but their overall economic benefit and payback period will depend primarily on usage and the relative costs of utility supplied electricity and fuels used for heating and cooling the home. To gain a better understanding of how “Geothermal Energy” works, to obtain more information about the various geothermal energy systems available, or to explore the advantages and disadvantages of geothermal energy, then Click Here to order your copy from Amazon today and learn more about Geothermal Energy and installing Geothermal Heat Pumps in your home to save money and the environment. I got this web page from my pal who shared with me concerning this web site and at the moment this time I am browsing this site and reading very informative articles here. I would like to know if a geothermal heat pump that can operate bellow -7degC like entering water temperature exists ? If yes, where can I find it ?